Very impressed with MP biltong in terms of taste and value for money. An excellent choice for a high protein snack. Would highly recommend. 2 more bags of biltong! I am originally from South Africa and have struggled for years to find good quality biltong in the UK but I now don't have to struggle any more. It is cheap and really good quality like all products from my protein. I have this whenever I need a snack. Love, love, love this product!!! I instantly decide to buy more, low fat, high protein and delicious, how do you need any other reasons to buy it? Got the peppered Beef Biltong- awesome snack to munch on when working at the desk. Fills you up quick and no need to have anything carb or high in salt like crisps. 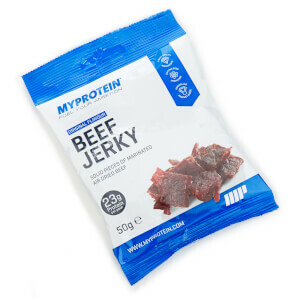 The quality of this biltong is excellent and a great price for real beef biltong (not jerky). I am a South African and I can honestly say it tastes great, there is a small bit of fat which you can easily not eat, I happen to like it. It's a dry biltong but not hard or brittle at all. Highly recommended!